AMD is hitting the ground running this holiday season by taking the wraps off some new bundles for select video cards that include up to three recently released games for free. The company is also announcing a major driver update that is available immediately. The bundles are available on AMD Radeon HD 7900, 7800 and HD 7770 GHz Edition video cards. The more expensive cards predictably receive more games. Here’s how it breaks down. HD 7900 Series – Far Cry 3, Hitman Absolution, Sleeping Dogs for free. 20 percent off Medal of Honor Warfighter Deluxe Edition. 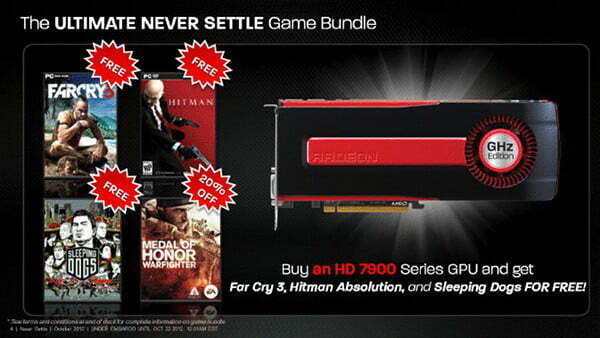 2x HD 7800 Series or 2x HD 7770 GHz Edition – Far Cry 3, Hitman Absolution for free. 20 percent off Medal of Honor Warfighter Deluxe Edition. HD 7800 Series or HD 7770 GHZ edition – Far Cry 3 for free. 20 percent off Medal of Honor Warfighter Deluxe Edition. These bundles are available immediately via participating retailers. An end date for the promotion was not provided, but the company said that this promotion will exist in conjunction with Black Friday sales and other holiday discounts. This suggests the bundle will be valid for most of the holiday shopping season. 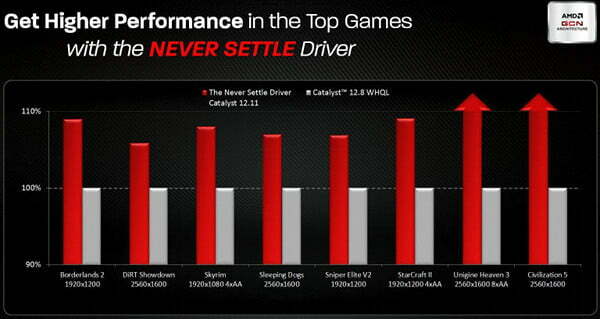 AMD’s driver announcement is focused on what it calls the Never Settle driver, also known as Catalyst 12.11. The company claims that installing this driver will improve performance of its video cards by up to 15 percent in many games including hits such as Battlefield 3 and Dirt Showdown. It should also provide better performance in the upcoming Medal Of Honor Warfighter. Today’s announcements are just the latest shot in an ongoing bundle battle fought between AMD and Nvidia, which is currently offering a free copy of Assassin’s Creed 3 with every GTX 650 Ti graphics card.